The Hawkeye Area Council is diligently preparing for quality a 2018 Summer Camp season at the Howard H. Cherry Scout Reservation including a Cub Scout Overnighters, Wolf/Bear Camp, Webelos Camp, and a Family Camp. In addition to council camping events, Red Cedar District will be hosting a Cub Scout Day Camp. Detailed information will not be available until early next year. Each scout will be sent a 2018 Summer Camp Brochure in mid-January. If your Scout does not receive one and would like a paper copy, please our Pack Event Coordinator Katie Bergen at katie.e.bergen@gmail.com. All of the this camp information will also be made available on our council's website as soon as it becomes available. Remember, the Howard H. Cherry Scout Reservation is YOUR CAMP! Take full advantage of these Summer Camp opportunities! Note about Day Camp: We will need adults (can be different adults) each day to walk with the group to keep the boys on track. 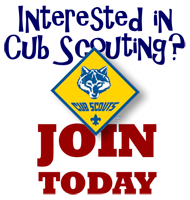 Adult to Scout ratio needs to be 1:5, minimum of two adults (for example, we need two adults for 10 Scouts, three adults for 11-15 Scouts, etc. ).